Here’s wishing you all the joys of the season. 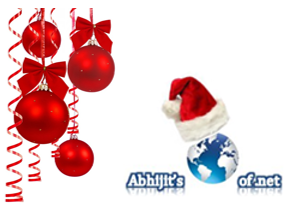 Wish you and your family a Merry Christmas and a prosperous New Year in advance. May this good times become the golden memories of tomorrow for all of you and bring abundant happiness in your life. It’s been few months I kept my self absent from the blogging due to some other priorities. I have couple of good news to share; will share with all of you very soon. I would like to express my sincere thanks to all the visitors, readers, followers of my blog for their encouragement, feedbacks and continuous support. Please keep visiting and share your feedback.